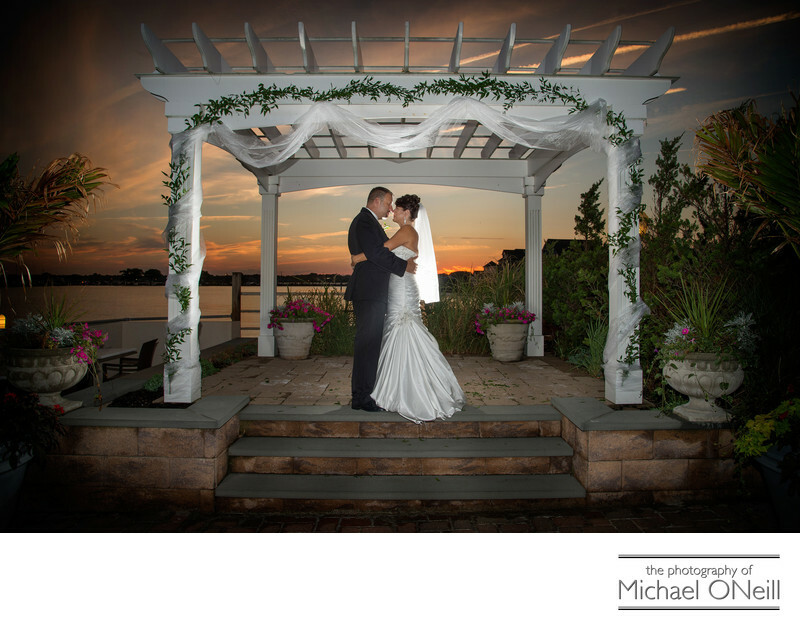 Long Island, New York is synonymous with waterfront weddings. There are so many different types. From the most casual beach weddings in the Hamptons to luxurious catering establishments overlooking Long Island Sound, The Great South Bay and the Atlantic Ocean. I’m often asked by my brides where the best locations are for sunset pictures on the water. The answer? There are hundreds. This particular image was captured at Lombardi’s on the Bay in Patchogue, NY. Other fine catering establishments that dot the shore of this body of water include The Riviera in Massapequa, Chateau La Mer in Lindenhurst, The Venetian Yacht Club in Babylon, Lands End in Sayville, The Bourne Mansion in Sayville, Capt. Bill’s in Bay Shore, The Snapper Inn, Sunset Harbor and probably a half dozen more that I’m forgetting. Over on the north shore of Long Island you’ll find Sea Cliff Manor, The Crescent Beach Club, The Harbor Club at Prime, Centerport and Northport Yacht Clubs, Lombardi’s on the Sound and Danford’s in Port Jefferson, The Miller Place Surf Club and more that I’m forgetting up there. Way out east on the south fork I have experience working at Oceanbleau at The Westhampton Bath and Tennis Club all the way out to Gurney’s Inn overlooking the Atlantic Ocean in Montauk, N.Y. Great sunset wedding photos start with a combination of choosing the right moment to take the picture coupled with the appropriate photographic lighting technique for the shot. Back in the digital darkroom some Photoshop techniques are used to enhance the rich colors of a dramatic Long Island sunset.